Throughout history poets have been drawn to write about insects, and entomologists have been drawn to try their hand at poetry. The concentrated industry of the ant and the delicate beauty of the butterfly, the rituals of the death watch beetle and the ethereal vision of glow worms at dusk, have all been captured in verse. John Tennent spent his childhood with a jam jar and an insatiable curiosity about insects. More than half a century later he is a global authority on butterflies and a dedicated reader of poetry. He has travelled, for his entomological research, to the world's wildest and most uninhabited places, collecting, in the depths of a tropical forest or on the shore of an unpeopled island, myriad experiences and life forms as rare as they are peculiar, and some of them decidedly dangerous. In the pages of this anthology he brings together classic poets such as Virgil and Byron and modern writers such as Pam Ayres, Spike Milligan and Peter Redgrove, alongside a wealth of other poets and amateur poets from different continents, to explore the mysterious world of the insect through poetry. 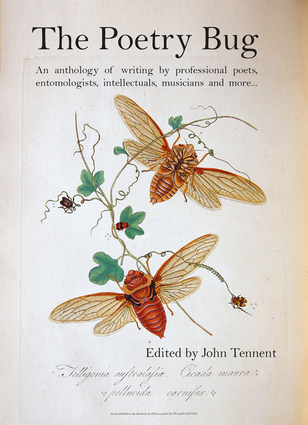 As fascinating as the poems themselves are John Tennent's personal anecdotes of confrontations with legions of hungry cockroaches, his encounters with remote tribespeople, and the excitement of discovering a previously unknown species of insect. Humorous, evocative and informative, The Poetry Bug is a celebration of every type of insect, from caterpillars to bedbugs. Always interested in wildlife, and particularly butterflies, John Tennent resigned from the Army in 1991 to pursue research into Lepidoptera and the history of natural history in many parts of the world, usually on the path least travelled. Most recently he has carried out research into Pacific butterfly biogeography and systematics on some remote islands of the southwest Pacific. He has described more than 100 butterflies new to science – many discovered by himself. He was awarded the Linnean Society HH Bloomer Medal for contributions to science in 2007 and is currently a member of the Names Committee for the North American Butterfly Association. His most recent research interests have included fauna on outer islands of Milne Bay Province, Papua New Guinea, funded by several museums, learned societies, and National Geographic, Washington. With a wide variety of interests outside the service environment, poetry has been important to him since he was a small boy growing up in North Yorkshire. He is the author of some 220 scientific papers and three books on butterflies.